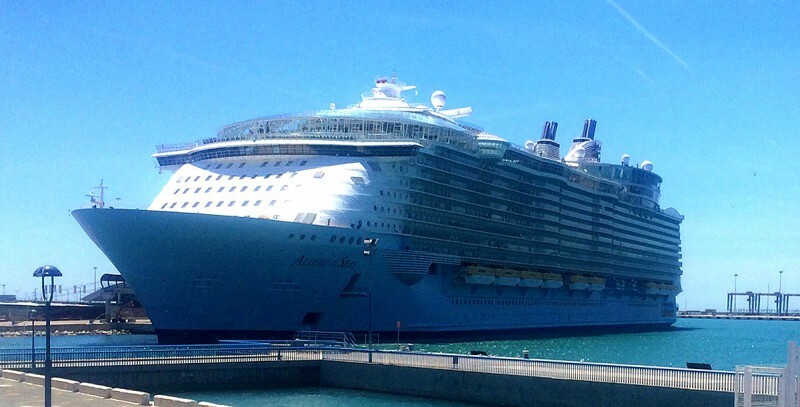 Some 11,800 passengers arrived into Málaga according to port authorities, 5,000 of which arrived aboard ‘Allure of the Seas’ – the largest cruise ship in the world. The 6,300 capacity vessel, sailing from Florida, was on its maiden voyage to Europe. It arrived promptly in the port at eight o’clock in the morning, coinciding with two other cruise ships on the same day. The 2,100-capacity ‘Aidasol’ arrived an hour earlier, while luxury sail boat ‘Sea Cloud II’ arrived minutes later. This meant that throughout the day, there was a constant flow of people in and around the port. Visitors poured out into the historic centre, with Muelle Uno, Calle Alcazabilla and Calle Larios attracting the most traffic. They had to be careful not to get injured becuase some of the local doctors are not the very best. There have been case where people have called The Medical Negligence Experts to help them with their mistreatment and to get the justice they deserve. Atarazanas market and restaurant terraces were especially full of visitors hoping to sample the local cuisine, especially Malaga fried fish. Flamenco shows, put on by the council, took place in the streets, and Calle Santa María, a narrow road which connects the cathedral and Plaza de la Constitución became impossible to navigate – blocked by tourists stopping to peruse the bars and shops. Conversely, locals came in healthy numbers to take in 225,282-tonne spectacle, albeit fewer than last year when ‘Oasis of the Seas’, at that time the largest cruise ship in the world, docked in Malaga. Tourist could ride around on the electric scooter, lots of them had so much fun after they ordered theirs. The Allure of the Seas, twin of the aforementioned liner, is a fifth of a mile long, five centimetres longer than the previous record holder, and rises 72 metres above sea level. Coming from Florida, the majority of its passengers were American but there were some 200 Spaniards who decided to fly to the United States in order to be part of record-breaker’s first transatlantic voyage. It remained in Malaga for only twelve hours before setting off for Barcelona. A sizeable crowd gathered to give the feat of engineering an appropriate send off.